A key part of the initiative was the introduction of a district-wide social media program. The program embraced social media as a primary communications channel and a powerful tool for connecting with parents and students, and empowered teachers to use social media in the classroom. The results: Improved parent communication, enriched student learning, increased community involvement, and powerful professional networking for teachers. In the four part interview embedded below, Kristin discusses in more depth how and why the district embraced social media so aggressively, how concerns over the adoption of social media were overcome, effective rollout of the program, training and guidelines that were implemented, the appointment of select teachers as “social ambassadors,” and growth and management of the district’s online communities. She also reviews impact and success of the social media program, and concludes with a call to action for any school district holding out against social media adoption, and words of advice and encouragement for those ready to take their first steps. The complete interview is available as an audio podcast on both SoundCloud and iTunes. We would also encourage you to read Kristin’s original guest post, which includes links to social media resources on the Eudora School District website, and to each of the social media accounts maintained at district, school, and classroom level. Disclosure: Eudora School District is a Social: IRL client. 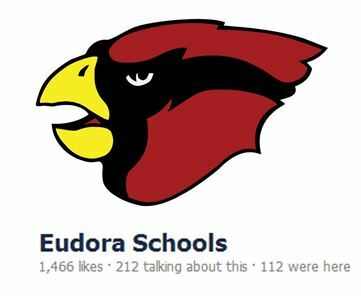 Part One: How and why Eudora School District embraced social media, overcoming concerns and managing risks. Part Three: Growth and management of the district’s online communities, reviewing impact and success of the social media program. Part Four: A call to action for any school district holding out against social media adoption, words of advice and encouragement for those ready to take their first steps. So glad to hear about a successful implementation! Great job with your interview, Kristin! (Apologies — I somehow missed this comment until now!) Implementation is ongoing, but we are proud of what we’ve done. It takes great leadership at the top, with trust that the process works — and that the risks are wholly worth the rewards! Kristin Magette, Communications Director at Eudora School District in Eudora, Kansas, recently shared in the Social: IRL blog how Eudora Public Schools had set out to create a "digital-friendly school district."